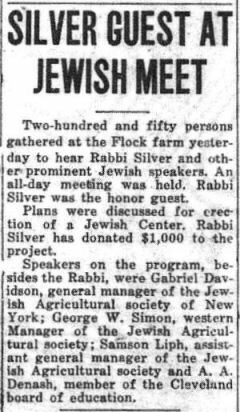 It was Labor Day, Monday September 3, 1928, when about 35 families - all the Jewish farming families in the area- and their honored guests, a total of about 250 persons, met on the Harpersfield farm of Meyer and Slova Flock. They had come dressed for an important event - a banquet under a large tent. The event was what we might call today the "kick off" of a campaign by the recently formed Jewish Farmers Association of Geneva Ohio. The only story of the event reported that its goal was to raise funds for a Jewish center. The honored guest was Rabbi Abba Hillel Silver of The Temple (today The Temple - Tifereth Israel). A Zionist leader who would be honored late in his life by the naming of the Kfar Silver agricultural school in Israel, Silver spoke of the importance of farming in Jewish history. His speech would have been most welcome as was the gift of $1,000 mentioned in the story. For more on the source of that gift, click here. The photo below shows Rabbi Silver with the visiting Jewish Agricultural Society officials and the Geneva Jewish Farmers Association officers. The panoramic photograph, so well organized with the children in front, was taken by Cleveland professional photographer H. Koss. Full size prints, captioned as shown below, were distributed to all attending the 1990 reunion of farmer families. Cleveland's two English-language weeklies did not mention the picnic. Then they devoted only two of their eight pages to news. The Farmers Association learned quickly. 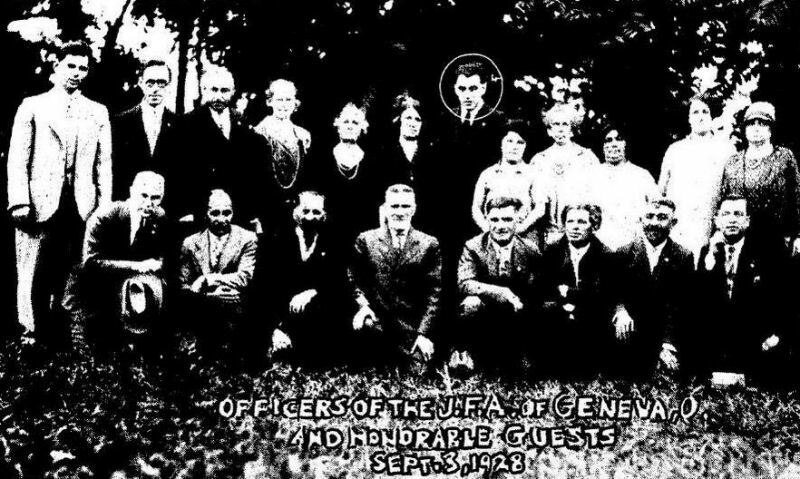 What was called the "second annual picnic" was again held at the Flock farm but was moved to Independence Day, Thursday July 4, 1929 and extended to include a bazaar that ran through Sunday July 7. The speakers were Rabbi Barnett Brickner of the Euclid Avenue Temple (today Anshe Chesed Fairmount Temple) and attorney Alfred Benesch, a trustee of The Temple (The Temple - Tifereth Israel). The two Cleveland Jewish weeklies carried similar stories. This announcement would not have brought anyone to the event as it does not include the time of the event, its cost, the address of the Flock (misspelled Fleck) farm, or how to learn more. If we find a poster or handbill we will add it to this page. 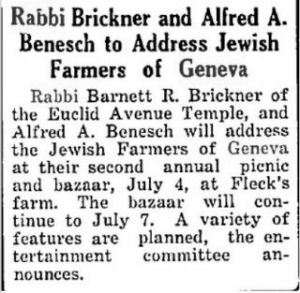 Was there a Jewish Farmers Association of Geneva Ohio?